To fall for a ripe plum is to plunge your teeth into a juicy poem, ripened for the reader. 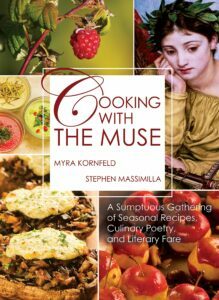 Poet Stephen Massimilla and cookbook author Myra Kornfeld explore the intersections of food and poetry in their seminal book, Cooking with the Muse, published by Tupelo Press. Quoting Lucille Clifton, “I taste in my natural appetite, the bond of live things everywhere.” Indeed, the connections Massimilla makes through poems corresponding to Kornfeld’s recipes center around a single ingredient which weaves together food and poetry with historical asides and cooking insights. What does it mean to be nourished? To find sustenance in the idea that “man cannot live on bread alone” is to offer, in response, sensory delights of wordplay as butter to the bread. Massimilla and Kornfeld’s camaraderie as cook and poet converge on the page, a flurry of 200 poems canoodling with 150 recipes in Muse. There are at least two ways to read this book: as a tome of essays and poetry or set out on a kitchen countertop, apron on. Either way, what makes their approach so enticing is that you can’t help but be engaged by the poetry if you’re cooking, or hunger for a taste of a corresponding recipe if you’re far from the stove. Cooking with the Muse is a literary feast of words and recipes that has gone on to clinch the National Indie Excellence Award and New England Book Award, among others. Muse casts a wide net into deep waters, submerging the reader into an ardent exploration of an ingredient through its historical roots—such as tracing Brussels sprouts’ popularity during the late Renaissance, paired with a recipe for Shaved Brussels Sprouts with Caramelized Shallots and Grana Padano Cheese. A single line of poetry can offer the cook inspiration, as evidenced in Osip Mandelstam writing “And I was alive in the blizzard of the blossoming pear” (Christian Wiman translation). Who wouldn’t then want to spoon into warm from the oven Apple-Pear Cranberry Crumble? Cooking with the muse is to invite it into the kitchen: to let it break the cook out of a culinary rut, or beckon the poet to the table—something Kornfeld and Massimilla’s Cooking with the Muse accomplishes tastefully. Annelies Zijderveld is the published author of Steeped: Recipes Infused with Tea, which was selected as one of the Los Angeles Times’ favorite cookbooks. Her poetry has appeared in Gluten-Free & More Magazine, Sated magazine, Garbanzo, and the New Guard. She is the creator of the literary food blog, the food poet, selected by Alimentum as one of their favorite food blogs. She has her MFA in poetry from New England College and is an associate editor of Poetry International. For more on her, visit her online at anneliesz.com or @anneliesz on Instagram. She lives in Oakland, California with her husband and cats.